The Galloway is a maternal breed, the cows are easy calving and has a abundant supply of milk. She is long lived and can be relied upon to produce calves every year, with many cows producing regularly into their teens and beyond. This trait alone can determine much of the economics and efficiency of any cattle operation. She will thrive and produce on low cost winter rations and in summer on unimproved rough grazing. 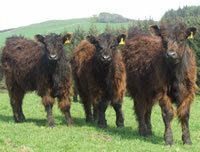 Galloway females are an ideal cross-breeding foundation with strong hybrid vigour. Galloway calves both pure or crossbred are hardy, vigorous and have a'will to live' that gets them up and nursing quickly, whilst small at birth, they grow quickly on their mother’s rich milk. Galloway cattle are naturally polled which they readily pass on to any other breed, which eliminates the need for de-horning. Galloway cows can be out wintered and only require the minimum of feeding, reducing the cost of feeding, straw and housing. One area the Galloway cow will surpass her bigger continental cousin is in her up keep. Comparisons have shown that she requires around 25% of concentrates and around 10kg of silage less per day. On hill and upland pastures the unselective grazing action of the Galloway improves the natural herbage for domestic stock, wildlife, and game through the removal of excess roughage. Galloways are becoming increasingly popular for controlling weeds, rashes and purple moor grasses on hill land, where sheep no longer graze. In some areas Native Cattle like Galloways can receive extra subsidises for grazing disadvantage land. The Galloway female when crossed with any continental bull, will produce either replacement suckler cows with all the attribute of her dam, excellent mothering abilites, milkiness and hardiness. Galloway x Saler heifers are much in demand as suckler cows as they have size and will pass on their easy fleshing qualities to their progeny. 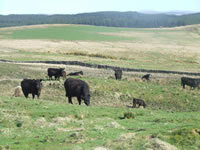 Galloway steers and heifers yield beef of the highest quality on low cost finishing rations. 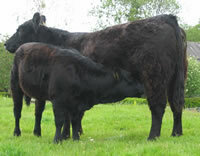 23 to 30 month old Galloway bullocks are regularly killed out over 350kg on a R4H Grade. 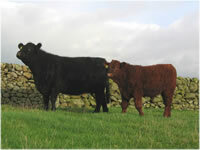 They are in great demand by many local butchers whose customer appreciates the taste of this natural, flavoursome beef. Studies have shown that Galloway beef is low in total fat and in saturated fat. The beef is also high in beneficial Omega 3 and Omega 6 fatty acids, therefore more beneficial than pork and as good as chicken and salmon.